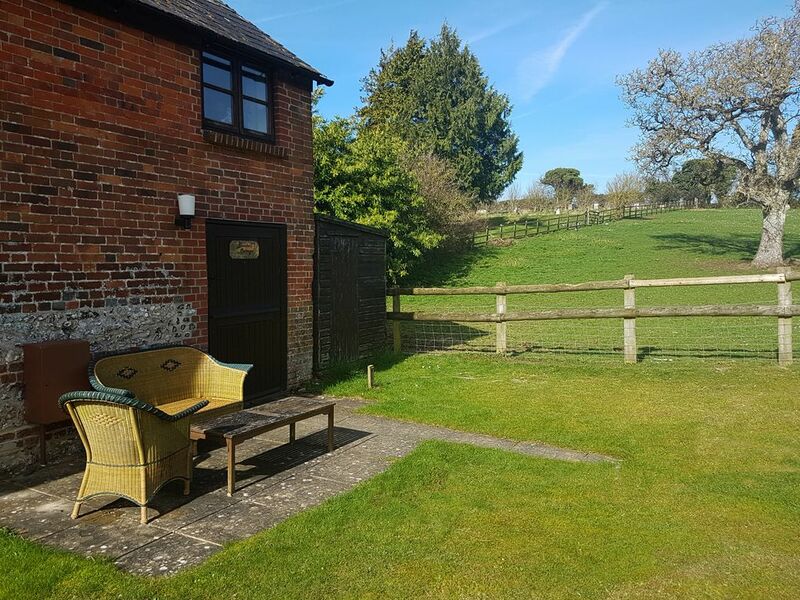 This pretty, end-terrace brick barn conversion is set on the ourtskirts of Pimperne in Dorset, next to an working equestrian centre, with one double bedroom accommodating two people. This pretty, end-terrace brick barn conversion is situated on the outskirts of Pimperne village in Dorset, beside a working equestrian centre. The property has a bright, open plan living area with a kitchen, dining table and sitting area, as well as exposed beams and painted brick walls. Upstairs is a super king-size bedroom with an en-suite bathroom and outside is a private patio with furniture in a shared lawned garden. There is off road parking and a shared games room on site. A great base for couples visiting Dorset. Amenities: Electric central heating. Electric oven and hob, microwave, fridge, washing machine, dishwasher, TV with Freeview, DVD, WiFi. Fuel and power inc. in rent. Bed linen and towels inc. in rent. Highchair and stairgate available on request. Off road parking for 1 car, road to property is unmade for last 100 yards and maybe unsuitable for some vehicles. Shared lawned garden and private patio with furniture. One well-behaved pet welcome. Sorry, no smoking. Shop and pub 1.5 miles. Note: Property on working farm centre, some associated noises may be heard. Region: Explore the fossils and stunning beaches of Dorsets Jurassic Coast, visit historic Sherborne and Shaftesbury, or enjoy the footpaths, country lanes and thatched-roof pubs Dorset offers. Town: Pimperne is a thriving little community, less than two miles from the attractive, North Dorset market town of Blandford Forum. It has a village shop and Post Office, two good pubs serving food, and a beautiful church with a font dating back to the 12th Century. Pimperne is steeped in history as behind the church, up on the hill, is an Iron-Age settlement which is thought to date back to 500BC. There is also a Long Barrow which, although never been opened, is estimated to be around 4000 years old! To the north of the village lies Cranborne Chase AONB, where you can find Larmer Tree Gardens, a wonderful collection of ornate buildings and secluded arbours. There is so much to see and do in this lovely area that youre well and truly spoilt for choice and sure of a fantastic holiday. One super king-size double bedroom. Bathroom with bath, shower over, basin and WC. Open plan living area with kitchen, dining area and sitting area. Shared games room with table tennis and table football. Electric central heating. Electric oven and hob, microwave, fridge, washing machine, dishwasher, TV with Freeview, DVD, WiFi. Fuel and power inc. in rent. Bed linen and towels inc. in rent. Highchair and stairgate available on request. Off road parking for 1 car, road to property is unmade for last 100 yards and maybe unsuitable for some vehicles. Shared lawned garden and private patio with furniture. One well-behaved pet welcome. Sorry, no smoking. Shop and pub 1.5 miles. Note: Property on working farm centre, some associated noises may be heard.